Steven is a classic, but it’s feeling rather middle aged circa 2015. Could this Spanish form of the name be a promising update? 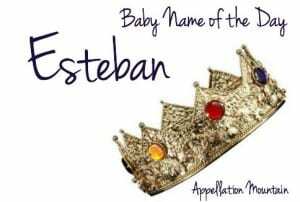 Thanks to Becky for suggesting Esteban as our Baby Name of the Day. Esteban feels like an import, and it is. It’s the most common Spanish form of Stephen. 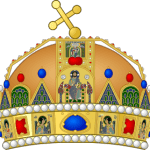 The original is Greek – Stephanos, which means crown. In the New Testament, Stephen was a deacon in the early church. He was stoned to death for his faith, making him the first Christian martyr. 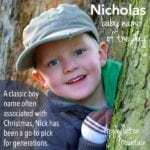 No surprise, then, that lots of parents have named their sons some form of the name over the years. Kings of England, Hungary, and Poland, along with ten popes, have answered to Stephen. Notable bearers abound, from novelist King to scientist Hawking to hoop star Curry. Stefan is another form of the name, heard in Scandinavia and parts of Eastern Europe. It’s a promising update to Stephen, but it hasn’t been much heard in recent years. Stefan reached the 300s in the 1980s, after a very young Tom Cruise wore the name in 1983’s All the Right Moves. Stefan ranked #851 in 2014. Stefanos takes us to Greece, and Stefano to Italy. Etienne is French. They all seem reasonably accessible in English. But could the Spanish Esteban be especially wearable in the US right now? Plenty of Spanish names have ranked in the US Top 100 in recent years, especially the Spanish equivalents of evergreen classics, like Diego (James), Jose (Joseph), and Luis (Louis). 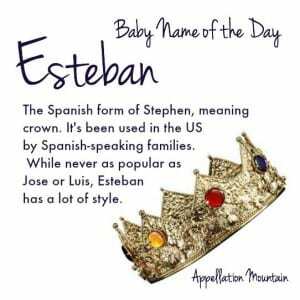 Other names aren’t obviously Spanish, but are embraced by Spanish-speaking families because they work beautifully in Spanish and English: Sebastian, Daniel, Adrian. Esteban seems like it’s not quite on trend – and yet it shares sounds with the ever-so-popular Sebastian. Esteban de Dorantes, better known as Estevanico. Estevanico was born in North Africa, sold into slavery, and joined a 1527 expedition to establish a colony in Florida. 300 men left on the trip; only Estevanico and three others returned. He traveled for eight years, becoming the first African native to set foot in the New World. Playwright Lope de Vega gave the name to a character in his 1619 classic, Fuenteovejuna. The story is based on historical events from a village in late fifteenth century Castile. Seventeenth century Spanish painter Bartolome Esteban Murillo. Estevan is the name of a town in Saskatchewan. George Stephen, born in Scotland, moved to Canada and established the Canadian Pacific Railway. The railway came to southeastern Saskatchewan in 1892, and the town took its name from George Stephen’s cable code, used for sending telegrams. He also named his Quebec summer home Estevan Lodge. Speaking of Estevan, Estavan is also listed as another spelling of the name. Neither spelling is especially popular in the US. In 2014, there were fewer than five newborn Estavans, 138 Estevans, and 788 Estebans. While Stephen is undeniably a classic, Esteban hasn’t been as widely used in the US. Television gave us Esteban Ramirez on Disney Channel’s The Suite Life of Zack and Cody – the show that helped boosted London as a girl’s name. And yet, it has great potential as a crossover name. Holding steady in the 300s in the US for the last decade, Esteban is easily recognized, but not common. Opt for the Estevan spelling, and I think it’s even more on trend – though certainly far less familiar. If you’re torn between fits-in Sebastian and stands-out Osvaldo, Esteban could be the name for you. What do you think of Esteban? Do you think it works well as a Spanish-English crossover name? Great to read all this interesting information. I suggested Esteban because it was the name we intended to use if our baby was a boy. My husband is from Chile and it is a name he has always wanted to give a son. As it turns out, we had a girl a few weeks ago and called her Florence! My husband is Steve, and Esteban is one of my pet names for him (I’m bilingual in Spanish). While I like the name, I don’t see it as the best crossover, but that’s because I’m a bit more particular about the pronunciation. An accented middle syllable is not intuitive for people from the U.S. They usually slaughter it and emphasize the first syllable–and I hate that pronunciation! Mere Mere, you’re right! We toyed with Esteban for about thirty seconds. I have a great uncle Steve, but our son’s first initial is A and our last name starts with S, so … Stephen was out! But Esteban and Etienne both implied heritage that we don’t have, so I knew my husband would say no. And I definitely would have mispronounced it – though I don’t think I realized it until you mentioned it!